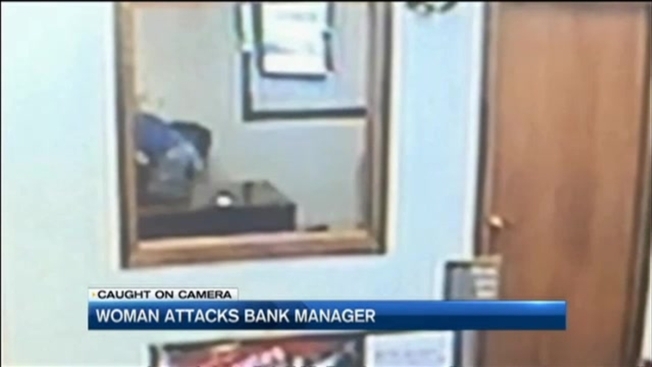 A surveillance camera inside the Salem Bank of America captured an unusual attack Thursday just after 4 p.m.
We're getting a first look at disturbing video out of Salem, New Hampshire where a woman is charged with attacking a bank manager with the very first thing she could get her hands on - a metal, three-hole punch. Tuesday afternoon was the first time that Salem Police officers were able to see the video of last week's incident. Captain Joel Dolan says he knew what to expect, and it was still shocking. "You can see the change in body language, you can see her start to get upset," Dolan says looking at the video. "You can see her pick up something up off the desk and strike her, that turns out to be the three hole punch," Dolan explains. He says the suspect in blue is trying to cash a check and when the bank manager refuses, the woman gets violent. "She's assaulting her and strangling her," he said. You can see customers witnessing the struggle, while employees try to get through a locked door to help the manager. "The door was locked behind them, so it took time to get into the office," Dolan said. Leanne Yerian, 35, of Salem, was arrested shortly after the incident and is now being held in Rockingham County Jail on $5,000 cash-only bail. When we asked Capt. Dolan if he's ever had a case involving a three-hole punch, he said, "No, it's the first time I've heard of a three-hole punch." NECN reached out to Bank of America to find out whether the manager's locked door was an accident or a policy that might need some reconsideration. A spokesperson tells us they can't comment because this is an ongoing investigation. Police say nobody was seriously hurt and it was back to business as usual at the bank that same day.